Enjoy a charged cell phone worry-free, anywhere and everywhere with the waterproof solar Power Bank. 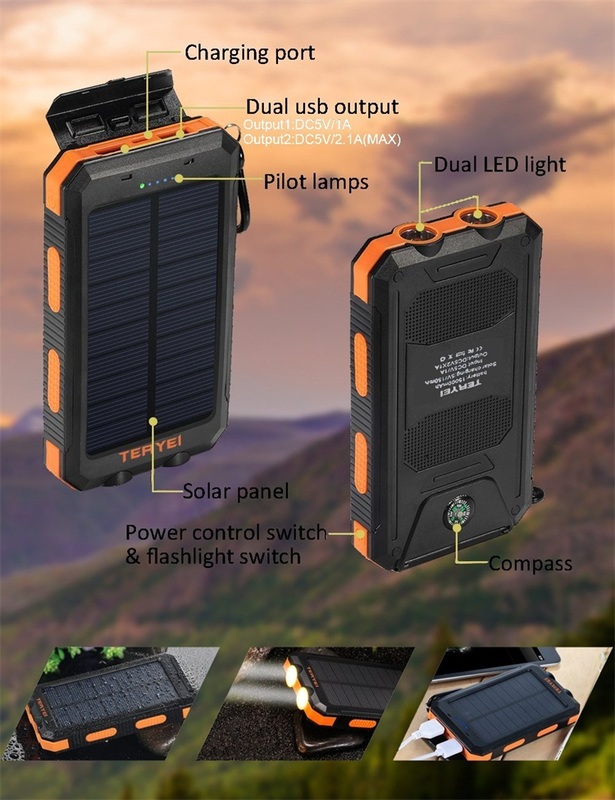 The portable solar power bank is skillfully engineered for maximum day-to-day durability, while its smooth no-slip exterior provides excellent grip, portability, and resistance to dust. The Power bank`s brilliant design also ensures its usb port stays in tip top shape during prolonged periods of charging.Charge your devices quickly and more efficiently with the power bank`s 8000 mAh`s of mobile power. This keychain power bank features a metal carabiner allowing you to carry it around with ease.Never give up charging your precious phone, tablet, iPod, or other mobile device while exercising again. With the Waterproof Power Bank, simply slide it across your key chain or sports belt and go. Rain or shine, land or water sports, this power bank charging device will provide safe, waterproof charging! We are sure you will be enamored with our portable product. 3 in 1 Custom USB Flash Drive Type-C 8G 16G 32G 64G. Easy to transmit data between Micro-USB, USB and Type-C port devices, such as macbook, Type-c smartphone and tablet, Android smartphone and tablet, computuer and laptop. No need any adaptors, sharing data conveniently and save time. This product is suitable for OTG-enabled Type-C interface phone. Easy to copy the memory card data to the phone, such as photos, video clips, office documents, etc. Support microSD, TF card. Can also be used directly to read U disk. OTG supported. Read TF/SD card directly on your USB C , Micro USB OTG supported devices and other USB port device. Adding an memory card, turns your card reader into a U Flash Disk. Aluminum Shell.Slim,light and fashion design, portable and convenient for using. 3 in 1 : Compatible with USB C device,Micro USB OTG supported devices and USB port device. Unique 3 in 1 Multifunctional Design: USB 3.1 Type C, USB Type A and Micro USB card reader. Support OTG, allows you to transfer and share your content between new-generation Smartphones, tablets and laptops with USB Type-C ports. USB 3.1 Type C Compatible: Connect your TF card with the latest USB-C devices. Fully compatible with USB 2.0, the reader transfers files quickly and efficiently. Even bulky files like HD video will transfer within minutes. We are a professional Chinese manufacturer of Usb Flash Drive , and looking forward to your cooperation!